Victor Edwards Sr. was born in 1884 in England. His family moved to America when he was a year old. In Idaho, he met and married Dorothy Nielsen, who was born in 1891 in Denmark. Victor and Dorothy moved to Greeley and started their vegetable market in 1908. They had eight children: seven daughters, Esther, Vera, Betty, Alice, Jean, Shirley and Beverly, and one son, Victor Jr. In 1933, the Edwards Family moved to Fort Morgan to start their Edwards Roadside Market at the current location. Victor would make trips to the western slope for tree-ripened fruit. They had a large truck garden located behind the market. Dorothy also had beautiful flowers that were sold along with the fruits and vegetables. Victor Sr. and Dorothy sold the business to their son, Victor Jr., in 1957. Victor Sr. died in 1958, and Dorothy passed away in 1962. Victor Edwards Jr. was born in 1919. He graduated from Fort Morgan High School in 1938. In 1944, he enlisted in the Marines and served two years during World War II. Vic married Fern Luebcke and had three children: Jim, Ron and Sandy. In 1958, the old Roadside Market was torn down and a new store was built. The store was 60 ft wide and 50 ft deep. In 1968, Vic remodeled the store with an addition of 80 ft to the back, and he changed the name to Edwards Right Price Market. Vic also trucked fruit from the western slope, like his father, and made many good friends with the orchard growers. Vic served 28 years in the Fort Morgan Volunteer Fire Department 1941-1969. The last 6 years he served as Fire Chief. He was also a member of the Fort Morgan Chamber of Commerce, the Fort Morgan Elks Lodge, and the American Legion. Vic passed away in 2000. 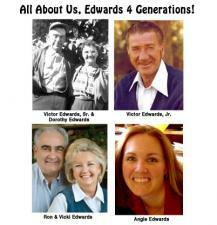 Ron Edwards: With its incorporation in 1974, Edwards Right Price Market Inc. saw its third generation, Ron. Ron Edwards and Vicki Stroh were both born and raised in Fort Morgan. Ron graduated in 1965 and Vicki graduated in 1971 from Fort Morgan High School. They were married in 1972 and had identical twin daughters, Andrea and Angela. Andrea became a teacher and is presently employed for the Holyoke School District and married to Marcus Kammer. Angela is the 4th generation operating the store. Ron attended NJC and UNC. Ron enlisted in the Marines, ranked sergeant, and served in Vietnam for two years. Like his father, Ron grew up working in the store and, after returning from the service, picked up where he left off in the grocery business. With bedding plants and shrub sales increasing, Ron saw a need to expand and had Flowerland built in 1984. The grocery store doubled in size by expanding to the East in 1997 (the current store). Ron served on the Fort Morgan Chamber of Commerce as a board member from 1977-1978 and as President in 1979, served as City Councilman from 1980-1988, and as Mayor from 1988-1990. In 1989, he received the "Citizen of the Year" award and was also awarded Honorary Member of the Fort Morgan Fire Department. He's a member of the Elks, American Legion, the V.F.W. Ron and Vicki are members of the Christ Congregational Church. Community involvement was Vicki's main focus. For 20 years from 1971-1991, she served as the Executive Director of Morgan County United Way and managed the emergency food and shelter program for a 10 county jurisdiction. She was a trustee for the Heritage Foundation and a member of Hyperion. For the past 20 years, Vicki volunteered in Denver as a legislative aide at the State Capitol and helped on political campaigns. She served on the Congressional Academy Nominations Committee as well as helped with presidential and congressional dinners and receptions. Vicki was honored to serve as one of the nine Colorado Presidential Electors for the 2004 General Election and was asked by Governor Owens to serve on the Colorado Commemorative Quarter Commission with First Lady Frances Owens. Angie Edwards graduated from Fort Morgan High School in 1999 and attended UNC. She received her Bachelor of Arts in Business Management in 2003. She also grew up working in the store and wanted to carry on the family business, becoming the forth generation. She started operating the store in 2003.